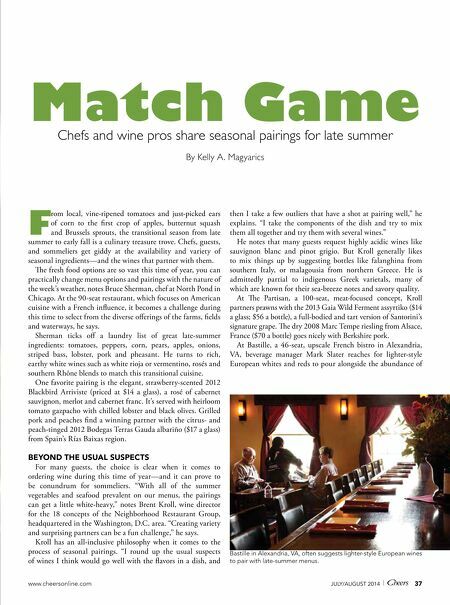 www.cheersonline.com 37 JULY/AUGUST 2014 | F rom local, vine-ripened tomatoes and just-picked ears of corn to the first crop of apples, butternut squash and Brussels sprouts, the transitional season from late summer to early fall is a culinary treasure trove. Chefs, guests, and sommeliers get giddy at the availability and variety of seasonal ingredients—and the wines that partner with them. e fresh food options are so vast this time of year, you can practically change menu options and pairings with the nature of the week's weather, notes Bruce Sherman, chef at North Pond in Chicago. At the 90-seat restaurant, which focuses on American cuisine with a French influence, it becomes a challenge during this time to select from the diverse offerings of the farms, fields and waterways, he says. Sherman ticks off a laundry list of great late-summer ingredients: tomatoes, peppers, corn, pears, apples, onions, striped bass, lobster, pork and pheasant. He turns to rich, earthy white wines such as white rioja or vermentino, rosés and southern Rhône blends to match this transitional cuisine. One favorite pairing is the elegant, strawberry-scented 2012 Blackbird Arriviste (priced at $14 a glass), a rosé of cabernet sauvignon, merlot and cabernet franc. It's served with heirloom tomato gazpacho with chilled lobster and black olives. Grilled pork and peaches find a winning partner with the citrus- and peach-tinged 2012 Bodegas Terras Gauda albariño ($17 a glass) from Spain's Rías Baixas region. BEYOND THE USUAL SUSPECTS For many guests, the choice is clear when it comes to ordering wine during this time of year—and it can prove to be conundrum for sommeliers. "With all of the summer vegetables and seafood prevalent on our menus, the pairings can get a little white-heavy," notes Brent Kroll, wine director for the 18 concepts of the Neighborhood Restaurant Group, headquartered in the Washington, D.C. area. "Creating variety and surprising partners can be a fun challenge," he says. 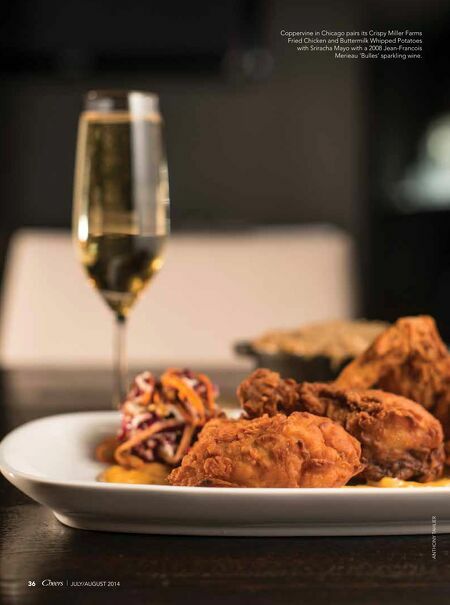 Kroll has an all-inclusive philosophy when it comes to the process of seasonal pairings. "I round up the usual suspects of wines I think would go well with the flavors in a dish, and then I take a few outliers that have a shot at pairing well," he explains. "I take the components of the dish and try to mix them all together and try them with several wines." He notes that many guests request highly acidic wines like sauvignon blanc and pinot grigio. But Kroll generally likes to mix things up by suggesting bottles like falanghina from southern Italy, or malagousia from northern Greece. He is admittedly partial to indigenous Greek varietals, many of which are known for their sea-breeze notes and savory quality. At e Partisan, a 100-seat, meat-focused concept, Kroll partners prawns with the 2013 Gaia Wild Ferment assyrtiko ($14 a glass; $56 a bottle), a full-bodied and tart version of Santorini's signature grape. e dry 2008 Marc Tempe riesling from Alsace, France ($70 a bottle) goes nicely with Berkshire pork. At Bastille, a 46-seat, upscale French bistro in Alexandria, VA, beverage manager Mark Slater reaches for lighter-style European whites and reds to pour alongside the abundance of Match Game Chefs and wine pros share seasonal pairings for late summer By Kelly A. Magyarics Bastille in Alexandria, VA, often suggests lighter-style European wines to pair with late-summer menus.